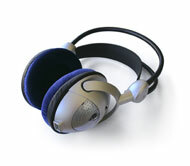 The headphones which American Idol season four winner Carrie Underwood used when she recorded her first album. HOLLYWOOD - The American Idol surprise of the season has occurred. Adam Lambert, the odds-on favorite to win the whole enchilada found himself in the 'Bottom Three' along with Kris Allen and Matt Giraud. Randy Jackson looked at Adam and said, "Hey bro, now listen up dawg, there must be a misprint, or a miscount, or something cause dawg, you got it. I mean dude listen up, I know Whitney Houston and Sam Houston and they can both sing. I also know Mariah Carey and the gal has got some great-looking legs on her. And dawg, I was in Journey and I can play the heck out of the bass guitar dawg." Kara rolled her eyes and turned to Randy and said, "Hey dawg, in the interest of time...who do you not know?" Then Paula jumped in, "Yeah, big dawg, name someone that you do not know and have not worked with?" Randy smiled and said that he had never worked with Susan Boyle, Shaheen Jafargholi, and Hollie Steel. Simon perked up and said that he is currently working with all three. He added that he just happens to manage all three performers along with managing Amy Winehouse, Celine Dion, Melissa Rivers, Jay Leno, and the Rolling Stones. Just then Adam Lambert chimed in and said "Hey boys and girls can we get back to me now." Ryan Seacrest laughed and right away he did his magic trick and he sent Kris Allen back to The Land of Safety, with Danny Gokey and Allison "Big Face" Iraheta. So that left Adam and Matt standing there underneath the 40,000 or so lights wondering which one would hit the road that leads back to their respective casa. And then Ryan announced that the concert had ended for Matt. Lambert walked over to The Land of Safety and Matt was handed the microphone and told to sing, which I have always thought is probably the last thing that the contestant wants to do since, afterall the whole nation has just told him or her that they are not good enough to continue. So I am still waiting for the time when one of the 'rejected' contestants says to Seacrest when he is asked to sing us out, "You know what Ryan? Thanks but no thanks. I mean hey, I have just gotten the friggin' rejection of my life. My stomach is hurting like hell, my head is spinning around. I cannot remember the friggin' lyrics. My legs feel like sticks of jello, my mouth is as dry as the Kalahari Desert, I couldn't be more embarrassed if I was standing here naked with a coconut donut around my you-know-what and you want me to friggin' sing. No sir, no way, no how, no McCain! I tell you what Ryan, you friggin' sing cause I'm outta here." In related news: Jamie Foxx, who was this week's contestant mentor will probably end up making a CD with Adam. He'll make a movie with Danny. He'll have Kris and Matt sing back up on his next CD. And he'll take Allison out and buy her three cheeseburgers, a family order of French fries, and a large chocolate milkshake.